The rarest of our parakeets, they can breed for 18 months straight if food is plentiful. Reports from the 1800s show that orange-fronted parakeets were once found throughout New Zealand. However, their distribution has reduced dramatically over the last century and the orange-fronted parakeet is now our rarest parakeet and forest bird in New Zealand. The remaining populations are all within a 30 km radius in beech forests of upland valleys within Arthur’s Pass National Park and Lake Sumner Forest Park in Canterbury, South Island. The easiest place to see them, although still difficult, is in the Hawdon valley in Arthur’s Pass National Park. Although kākāriki karaka are now confined to these few valleys, historic records suggest that in the later years of the 1800s, when beech seed was bountiful during mast years, the parakeets would have a breeding boom and disperse onto the Canterbury Plains. Introduced predators and habitat destruction are the main reasons for decline. Predators like stoats and rats are excellent hunters both on the ground and in trees and prey on parakeets as they nest and roost in tree holes. Eggs and nestlings are also preyed on by possums, and cats love catching unsuspecting fledglings. Orange-fronted parakeets are especially at risk from rat and stoat plagues caused by beech forest seeding or masts. We lost 85% of one valley population due to a single rat plague in 2001. Vast areas of native forest have been felled or burnt off by humans, decreasing the area available for parakeets. Possums, deer and stock add to the problem by browsing on plants and changing the forest structure. DOC protects orange-fronted parakeets through its Battle for our Birds predator control programme. This includes extensive trap lines and aerial 1080 poison when rodent numbers rise to potentially damaging levels. 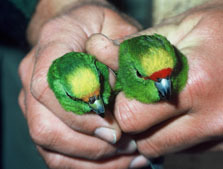 Nine parakeet nests in the Maruia valley were monitored though a 1080 operation designed to suppress a rat plague in November 2009. One nest was eaten by either a rat or a stoat but the other eight were fine. Without 1080 we would have no viable orange-fronted parakeet populations left on the mainland. We aim to ensure the survival of orange-fronted parakeets both on the mainland and on predator-free islands. All known populations are closely monitored. Research focuses on their breeding by doing nest searches and inspecting the nest holes for their level of fledging success. We intensively monitor and control rats, stoats and possums to keep numbers to low levels. 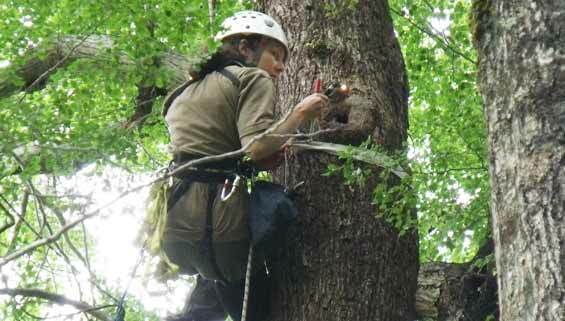 Monitoring of predator numbers is undertaken year-round and sites are intensively monitored during beech masts years when rat plagues are likely to occur. We work in partnership with The Isaacs Conservation and Wildlife Trust in Christchurch to raise orange-fronted parakeets in captivity. A captive breeding programme was started in 2003, when eggs were taken from the wild and foster birds successfully raised the off-spring. 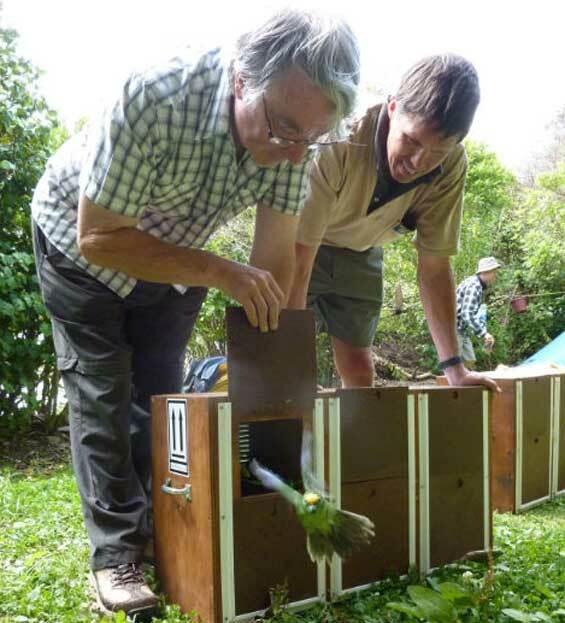 Since then The Isaac Conservation and Wildlife Trust has bred and raised more than 400 orange-fronted parakeets for release on predator-free islands and back into Canterbury valleys. We also harvest eggs from the wild to maintain the genetic diversity of the parakeet population. When enjoying Canterbury’s beech forests, take note of any signs warning of poison and other DOC signs. Do not interfere with native birds or the traps and bait stations that are there to protect them. Dogs are not allowed in Arthur’s Pass National Park or Lake Sumner Forest Park. Become a volunteer in the orange-fronted parakeet programme. Christchurch Helicopters have set up a trust where you can make a donation to help save the orange-fronted parakeet.